People frequently ask me for a list of the most influential costume design of all time, whether it's questions I get online, in interviews, or when I give presentations. Of course this is some of why I created The Style Essentials in the first place. But that is a list of 50--some want me to narrow my list to the top 3. And so, when pressed, I have chosen Travilla's costumes for Marilyn Monroe in The Seven Year Itch (1955) to be at #1. Close behind at #2 would be Hubert de Givenchy's costumes for Audrey Hepburn in Breakfast at Tiffany's (1961). And finally, to finish this elite list, would be Jean Louis' costumes for Rita Hayworth in Gilda (1946). It was the most famous dress I ever made....Inside there was a harness like you put on a horse. We put grosgrain under the bust with darts and three stays--one in the center, two on the sides. Then we moulded plastic softened over a gas flame and shaped around the top of the dress. No matter how she moved, the dress did not fall down. With this costume, as well as others in the movie, Jean did what all the great costume designers did--he made his star look her absolute best. It may seem hard to believe, but even Rita Hayworth had her flaws. "Rita had a good body. It wasn't difficult to dress her," Louis said. "She was very thin-limbed--the legs were thin, the arms long and thin, and she had beautiful hands. But the body was thick. She also had a belly then [some due to Rita's recent pregnancy], but we could hide that." You'll notice in the "Mame" gown that Jean includes a faux tie to the side that somewhat conceals her mid-section. 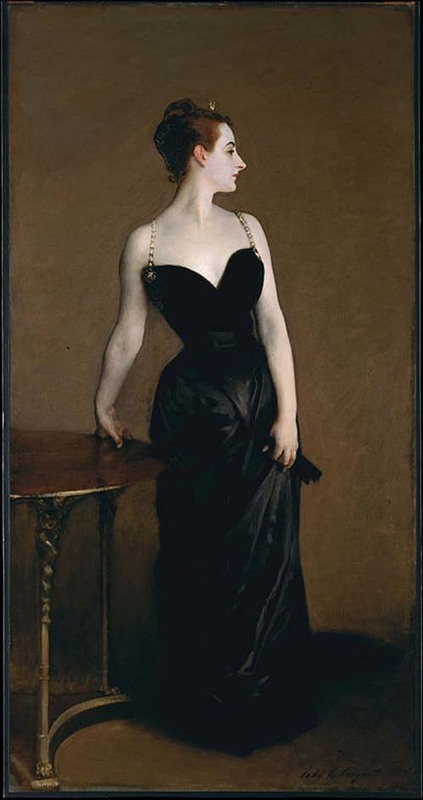 It also bares her shoulders, which acts to draw the audience's eye upward. Everything was done to make sure the gown was fit to flatter Rita's 5'6" figure. Gilda is one of The Style Essentials on GlamAmor for the influence of its costume design--both then and now. In the 1930s and 1940s, films were at the forefront of fashion. Because of the production process, films were often made a year or so before their release. Thus, costume designers had to be ahead of trends and often set them once the movie premiered; for decades, they largely determined how women dressed. Rita's strapless "Mame" gown captured the imagination of audiences at the time and the design's popularity would continue well into the 1950s. Though Travis Banton had created a strapless gown for film two years earlier, it was Louis' look in Gilda that inspired the trend. In fact, the Gilda gown is so iconic that it continues to inspire fashion today. You would be hard-pressed to find an awards show red carpet that doesn't have at least one dress that owes some of its design to Jean Louis. I show several examples of this from recent years below. Vera Wang and Giorgio Armani are but two fashion designers who reference Gilda in their own gowns. All the designers I include range in the amount of detail they borrow from the "Mame" dress, but you'll see that some of the bodices, in particular, are spot on in their homage to Gilda. You'll also see that most of the examples come from the Oscars and Golden Globes, which is significant. These are two red carpets where stylists must choose gowns that are the very best in design and will stand the test of time. These choices are commercially viable as well; each dress converts into heavy sales for the fashion houses (not to mention knock-off shops) once they are seen at these prestigious events. Beyond the "Mame" gown itself, stylists also gravitate time and time again to hair and makeup that is inspired by Rita and her signature look in Gilda. You'll see long wavy hairstyles that are often swept to one side...whether the star is a blonde, brunette, or (appropriately) a redhead. The makeup is classic, too, featuring Rita's lined bedroom eyes or red lips that were popular on stars like her during the 1940s. And do not think for a second that this is simply a trend of the past few years. Both Rita and this gown are timeless in their style and have long acted as inspiration. There are many more incredible costumes in Gilda that influence designers today, so I encourage you to read the full article I recently wrote for GlamAmor on the film. You'll learn more about Rita and costume designer Jean Louis, including how he worked around the existing Hays Code to create such a sensual wardrobe for her. You'll also meet other talented artists who were involved in the production. It's a fascinating backstory. In any case, keep your eyes on the red carpets this upcoming award season. 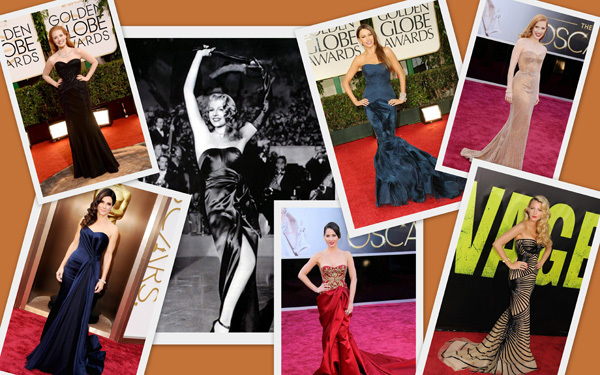 Tweet me @GlamAmor the next time you spot your own example of a gown inspired by Gilda.